Ontario has a no-fault system of car insurance. This means that regardless of whose fault the accident is, that you are entitled to a wide array of benefits from your car insurance company; or from the car insurance company of the other vehicle that hit you if you didn’t have car insurance at the time of the accident. For you, accident benefit law will translate in to a lot of paper work, and a lot of hard to understand forms for you, your therapists, employer and doctor to complete. All of these forms are confusing and time consuming. Failing to fill out these forms properly can ruin a perfectly good personal injury case. Don’t get hurt again. Do it right the first time and trust the law firm the other lawyer have been trusting for years. 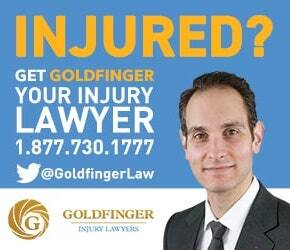 Goldfinger Law has assisted countless victims in recovering millions of dollars worth of benefits from their car accident claims. Did you know that over 42% of claims to submitted to car insurance companies for benefits get denied right away. This keeps our team of lawyers, law clerks, and accident benefit network busy as we are constantly fighting with insurance companies to get those benefits which you’re entitled to. The laws of accident benefit insurance are constantly changing. Just recently, car insurance benefits for medical and rehabilitative benefits have been cut in half from $100,000 to $50,000; and down to $3,500 for accidents which fall in to the Minor Injury Guideline. Caregiver Benefits which were at $250/week have been eliminated all together. Attendant Care Benefits which used to be at $3,000/month for non-catastrophic cases; have been cut in half to $1,500/month. Goldfinger Law has been at the forefront of the political battlefield assisting such organizations as the Ontario Trial Lawyers Association to reverse these changes to Ontario’s car insurance regime which negatively impact average Ontario drivers and victims. Whether it’s a claim for income replacement benefits, attendant care benefits, or you just want to get those physiotherapy or chiropractic bills paid by your car insurer; Goldfinger Law is the firm for you. Our tactful negotiating skills, combined with our tenacity and knowledge in the area of accident benefits law is a recipe for a successful claim. Contact us today for your free, no hassle, no pressure consultation with one of our personal injury lawyers. We would be pleased to hear from you, your family or your loved ones about your case. Servicing victims across Ontario, with offices in Toronto, London and Peterborough to treat you right.